A radical design backed by a proven pedigree. 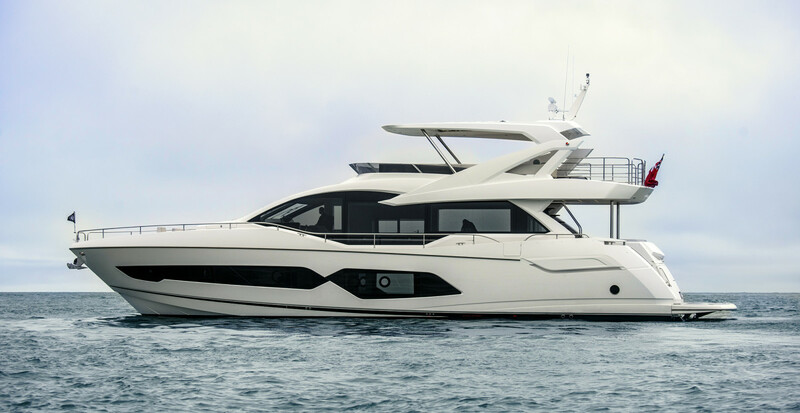 With this new 76, Sunseeker replaces a reliable model with something a bit more radical, a flybridge yacht that stays ahead of the curve. It was foggy. Properly, Englishly foggy. Driving over to Poole from the West Country, I had to slow right down on the old A35 trunk road, which most days offers spectacular views south to the sea from the high chalk downs. On this day, the scenery lay under a gray shroud, pierced only by the lights of speeding cars driven by people with X-ray vision. It was early November—late in the fall, I suppose, but it looked a lot like winter. It was no better down at the dock. White Sunseekers lay alongside the seawall like ghost ships in the gloom, while behind them big assembly sheds seemed to hover, distant and insubstantial. 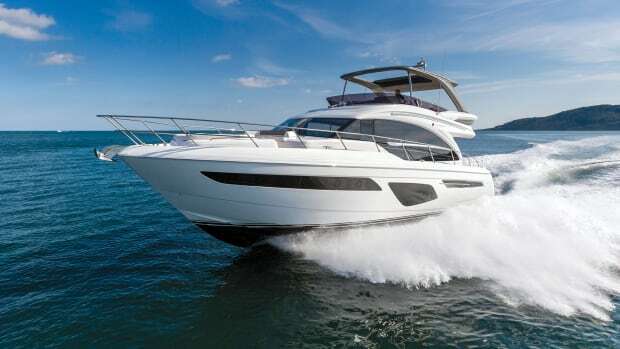 On board the new Sunseeker 76 the windows might as well have been lined with tracing paper, but the test crew had the lights on, the heating fired up and the helm instrumentation glowing in anticipation. It seemed I was the only one with any concerns. Well, OK then—let’s go. Just outside Poole’s huge natural harbor a long training bank below the surface is designed to focus the flow of the tide to keep the channel from silting up, and most summers some hapless goon leaves his propellers behind as he speeds across this invisible obstacle. It’s not something I’ve done myself, but on a boat I never say never. However, our crew seemed to know where it was without needing to look out of the window, and the high chalk cliffs of Handfast Point provided an excellent radar echo. Even with a close-to-single-level layout, the 76 features a number of different social spaces in the salon. 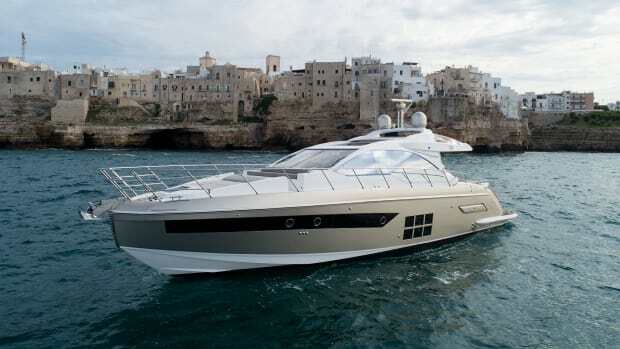 The 76 is all-new and replaces the 75 in the Sunseeker line-up, which grew out of the earlier 73. 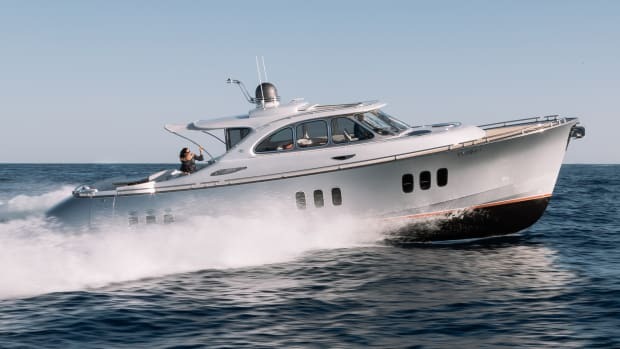 These were important and successful boats for the company—more than 100 were built—but with a radically restyled superstructure on a hull that is both longer and beamier, the new yacht offers a number of enhancements. Some of these, like the huge windows that make a dramatic statement on the main deck, with matching cutaway gunwales to maximize the view, simply reflect changing fashions. 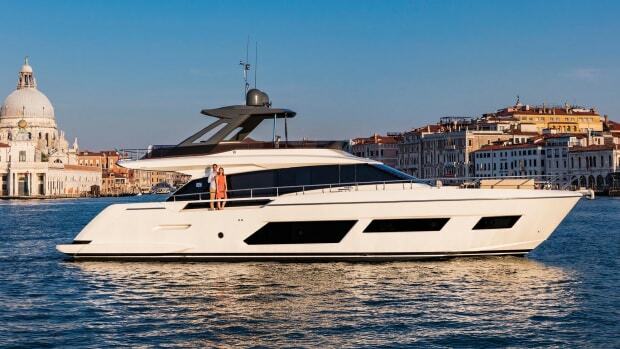 The impressive foredeck furnishings, too, are a response to modern market demands—although the 76’s versatile suite of sunbeds, sofa, and dining table do appear to move the game on. 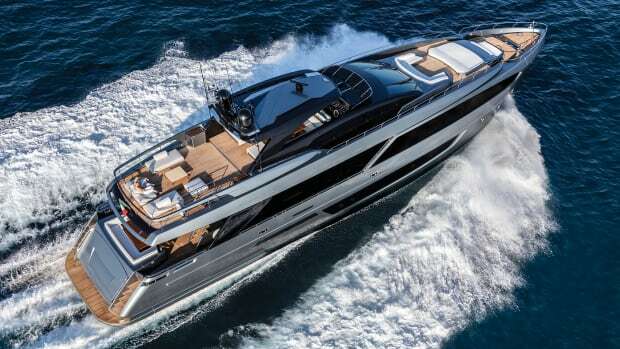 Other changes, like the improved crew cabin with engine room access, and the right-angled, glass-sided main companionway—more practical than its semi-circular predecessor—address acknowledged shortcomings in the older models. 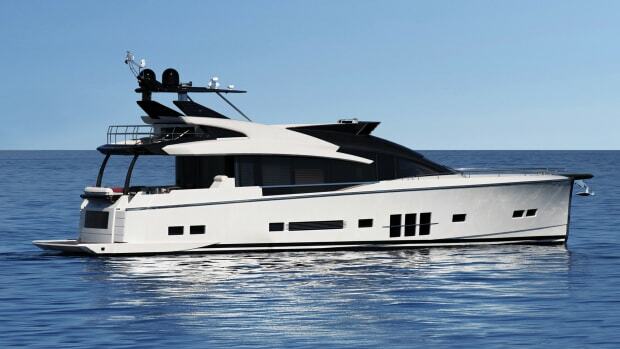 And some are simply great new ideas, like the opening glass sunroof over the lower helm station, complete with blinds, which might actually be a unique feature for a full flybridge yacht of this class. Bespoke stowage tubes for the foredeck sun awnings are another little spark of genius. An island divides the galley from the salon and provides added counter space. 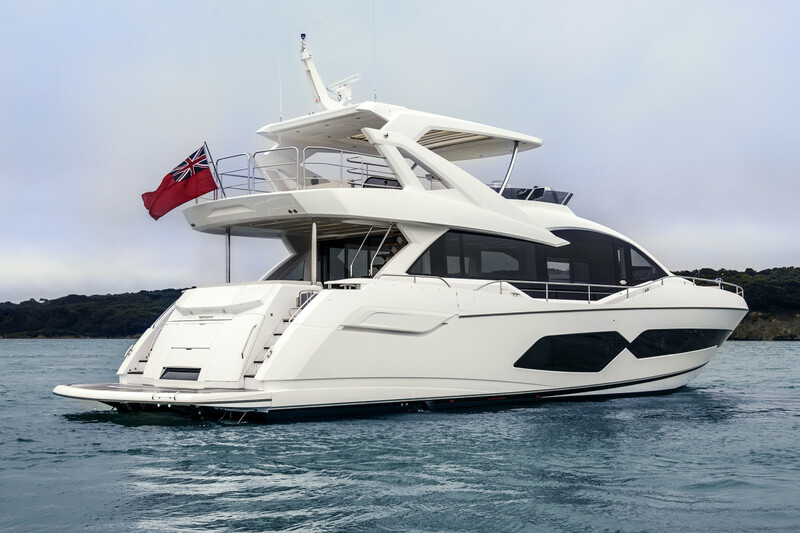 Down on the lower deck, the layout of the 76 is substantially similar to those of its predecessors, with full-size berths and a luxurious 6 feet 6 inches of headroom throughout. 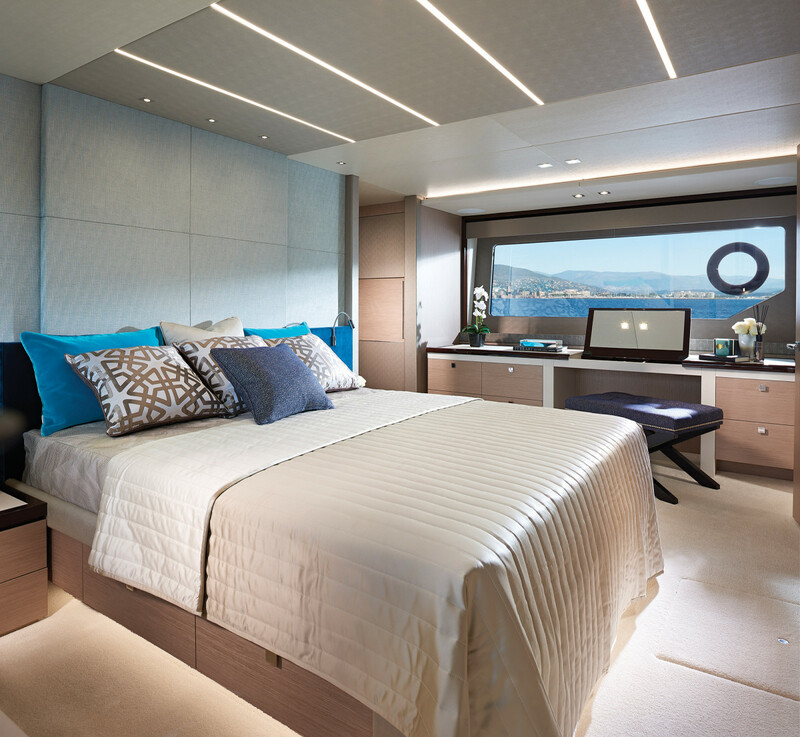 The midships master, in particular, is a spectacular space, with giant hull windows, a walk-in wardrobe, and a comfortable head and shower compartment with twin basins. 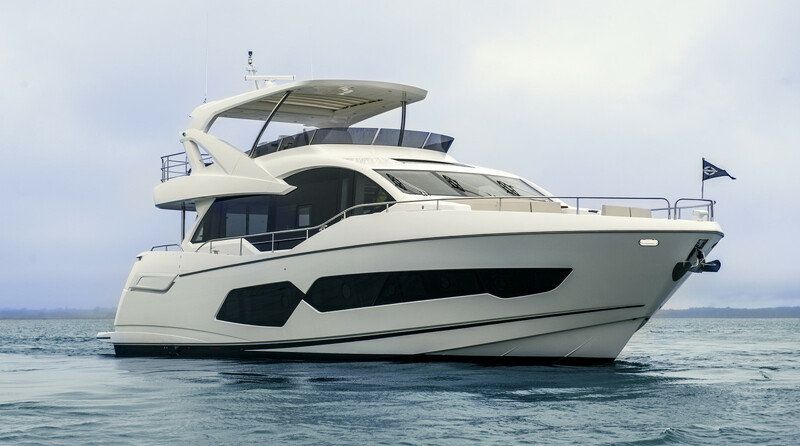 The VIP occupies less floor area, but is nevertheless a comfortable suite—assuming the height of the berth doesn’t cause you any problems—and the twin berths in the port guest cabin can slide together electrically to make a useful double that’s 4 feet 8 inches wide. Options abound. 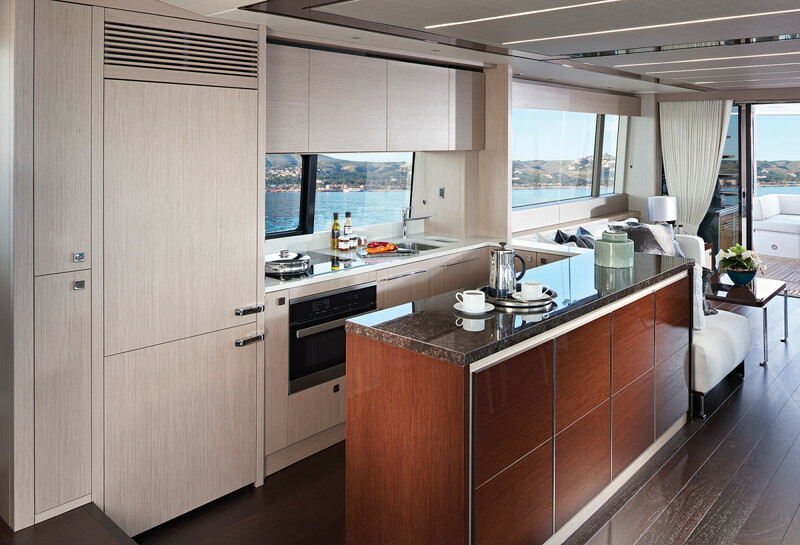 This owner had chosen the sideboard instead of the sofa in his stateroom—you can never have enough stowage on a boat—and had also elected to fit an extra fridge in the useful locker at the foot of the main companionway. 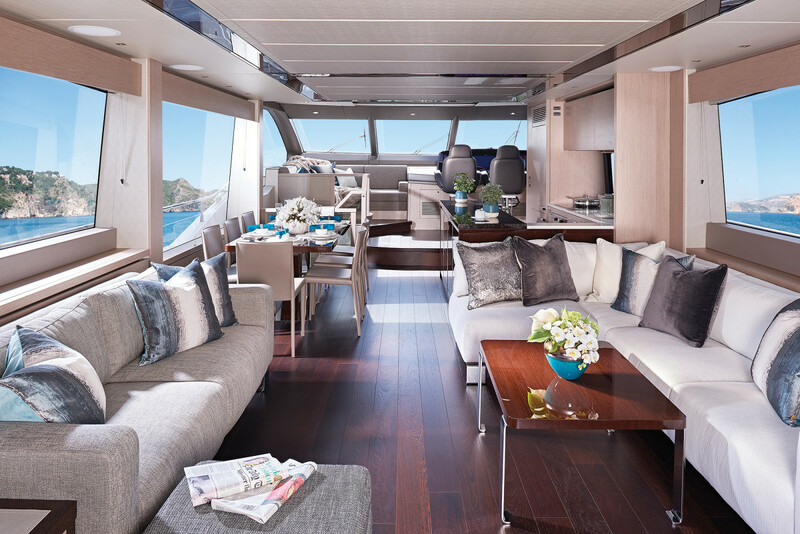 There is a variety of choices of bulkhead veneers, granite worktops, and hardwoods underfoot—our test yacht had the “antique granite” and wenge flooring, with white oak veneers. 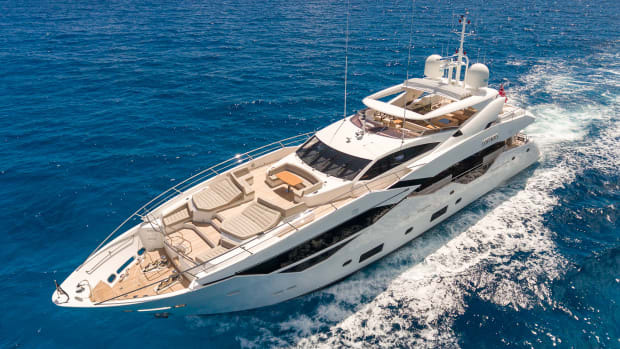 You can also select from three different galley arrangements on the main deck—open plan, enclosed, or even banished below to take the place of the port guest cabin while leaving space upstairs for a huge circular dining table. Up on the flybridge, a hot tub can be installed aft or, if you prefer, a crane and stowage chocks for a PWC. The mechanism of the hydraulic aft platform can be strengthened if you need to mount a larger tender than the Williams 385 it was designed for. 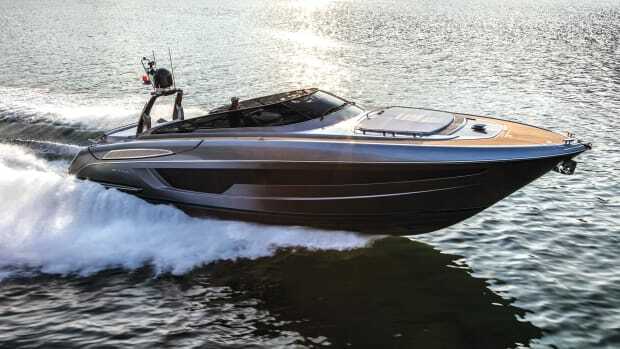 Sunseeker specifies 1,400-horsepower MAN V12s as standard for the 76, but our test vessel had the more powerful 1,550-hp option. 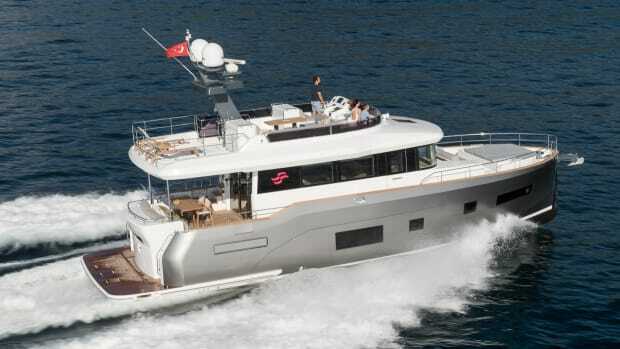 The machinery space, reached via the watertight door in an excellent aft cabin that features a double bed to port and a sofa under the transom window, is as spacious and well organized as the guest accommodation. Headroom is more than 7 feet between the engines, the gensets are tidily installed on the port aft bulkhead, the fuel tanks are mounted outboard, and servicing access is unimpeded by the useful stowage racks overhead. Note the big windows in the master. Another option fitted to our test boat was Side-Power’s futuristic-looking, curved Vector fin stabilizers, which have a “zero-speed” capability. On a calm sea the best way to test this is to charge around in circles to create some turbulence, and then edge the boat into it to see what happens. Nothing much, as it turned out: The 76 hardly rolled at all. Even on a calm day these fins are not intended to be locked when underway at speeds above 15 knots or so, because Side-Power feels that they might interfere with the boat’s handling if they can’t react to the attitudes they are designed to deal with. This is fine, of course, and most of the time you don’t even notice that the fins are sharing the driving, but we did feel that their initial refusal to allow any heel in hard turns was a bit humorless. Once they relented, though, the 76 proved to have the enjoyable handling for which Sunseekers have long been known, although their reluctance to allow the hull to right itself again on straightening up felt a little strange. Twin MAN 1400 V12s may be the standard fit, but our test 1550s showed themselves to be an excellent match for the 76, powering the big yacht to a two-way average maximum of 33 knots in the tidal waters off Old Harry, this coastline’s famous chalk stack, while the yacht’s moderate-V hull shape allowed for a wide range of cruising speeds all the way down to the high teens. 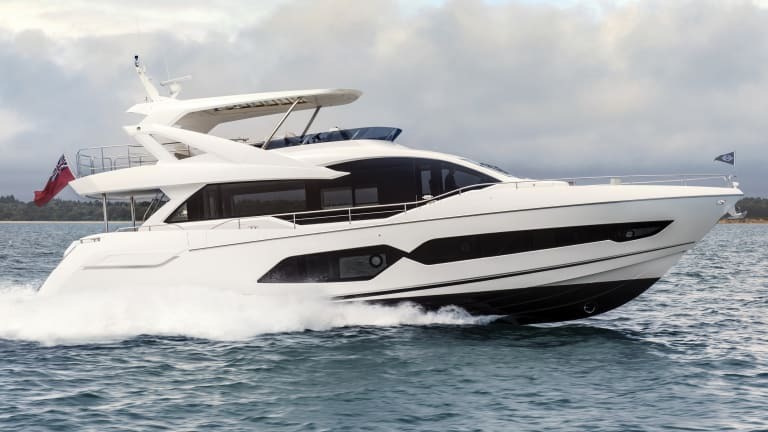 Well-mannered, quick to accelerate and responsive on the helm, Sunseeker’s new 76 is not just a pleasure to be aboard, it’s also fun to drive. The “Jurassic Coast” of Dorset is one of the most spectacular in the world, but only when you can see it. Late in the year the sun can take its time breaking through and melting the fog away, but when it does the white chalk cliffs and clear, turquoise waters provide a cruising backdrop like no other. OK, it was still a pretty gray and chilly November day, but at least I could keep an eye on that pesky training bank. Test Conditions: Air temperature: 57°F; seas: 1-2&apos;; wind: 5-7 knots. Load: 515 gal. fuel, 230 gal. water, 4 crew.. Speeds are two-way averages measured w/GPS. GPH taken via MAN display. Range is 90% of advertised fuel capacity. 65 dB(A) is the level of normal conversation.